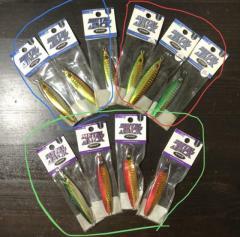 Selling brand new in packaging Senses jigs for those going for jigging trips come this April. 3 of them are labelled with 'QC reject' but I've caught fishes with these so-called 'QC reject' jigs. Selling all for $25. Grab them now. Collection at Tampines One Taxi Stand.